The Program for the Study of Developed Shorelines at Western Carolina University (WCU) is using relational tools (Microsoft Access) and a geographic information system (ArcGIS) to build a national storm surge database. The database is comprehensive, queriable and will provide one central location for coastal scientists and engineers to access storm surge and high water mark data. The national database currently contains over 5,800 storm surge data points from 42 hurricanes. Detailed geo-referenced storm characteristics from NOAA’s International Best Track Archive for Climate Stewardship are also part of the database, and include storm track, wind speed, central pressure and storm diameter. This allows the database to be queried to match storm characteristics with the surge generated. An important aspect of this project is distributing this storm surge information to the public. Both a user-friendly website and mobile application are being developed from the database for simple lay person access to storm surge data for all localities. The database and public access tools will assist in educating coastal residents, emergency planners, and developers about past storm surge flood levels. The database can also be used by scientists and engineers to verify storm surge models and examine the controls on storm surge variability. 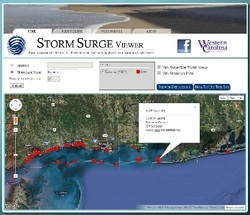 Click here to visit the Storm Surge Viewer! Contact Katie Peek for more information. During a hurricane, storm surge is often the greatest factor contributing to loss of life and property along the coast. 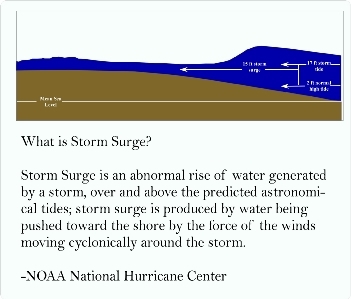 Therefore, predicting the height of storm surge for an approaching storm is vital for coastal communities. Predicting a value for storm surge has proven to be extremely difficult, due to the numerous factors that can contribute to the overall rise in water level. One setback for these predictions is the lack of one central location to access past storm surge measurements. Prior to this project, most water level data has been stored within storm specific reports and documents.Numerous different types of measurements are part of the database, including hurricane tracks, characteristics, and water level data.